Welcome back! Today’s focus in our 72 hour emergency kits is cooking! Having a cooking method in your kit is not mandatory, but will help if you want to heat or cook food OR are planning to use boiling as a water purification method. If you are packing foods that don’t need cooked like energy bars, survival food rations, or granola and jerky, and have an alternate means of providing enough water, you may not need to worry about including a cooking method in your kit. I cover portable cooking methods in the first chapter of my book, so if you want more depth than we are going into here, get yourself a copy! Size of the stove–will it fit in your pack? Weight of the stove–is it unnecessarily heavy? Fuel–what type of fuel does it need and have you packed enough? Container for cooking–do you have a sturdy metal container of some kind to heat your food or water in? 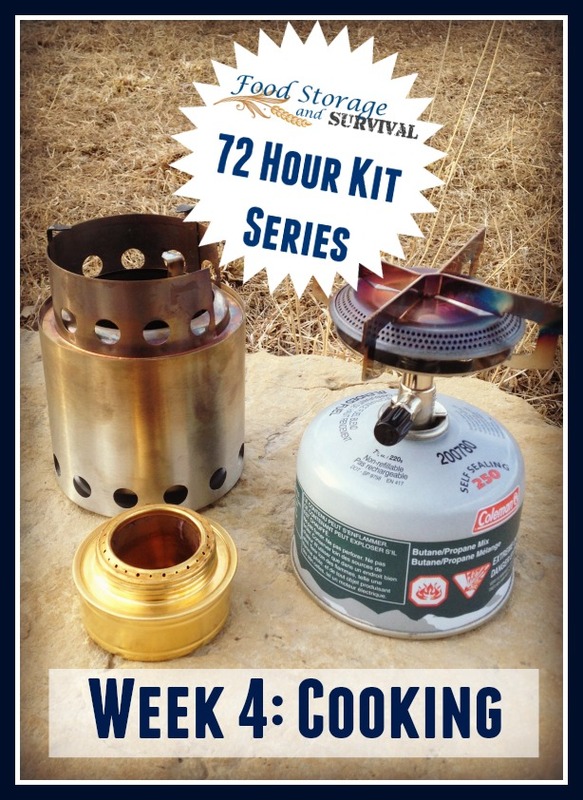 Light weight and easily portable, these are some of my favorite emergency kit cooking options. 1. Alcohol stove. Super light weight and inexpensive, an alcohol stove burns Denatured Alcohol (found in the paint section of your hardware store) or HEET in the yellow bottle (found in the automotive section of your local big box store or at an auto parts store or even some convenience stores). Most of these stoves are designed to transport some of their own fuel, but you’ll probably want to add a fuel bottle with extra alcohol to be able to use it more than a couple of times. Light with a flame or a spark, so you can get it lit even if all your matches are gone. 2. Backpacking stove. Designed for serious backpackers and campers, these little stoves attach to a fuel bottle either directly or with an extended fuel line depending on the stove design. They light quickly and have controls to vary the amount of flame, so they are similar to cooking on your range at home. Be sure you get the right kind of fuel for the stove you have. 3. Biomass stoves. These come in various designs and weights, but all burn bio fuel–sticks, pine cones, leaves. Some pack flat, requiring assembling prior to each use, others don’t pack down much at all from their cooking configuration. I have reviewed the Solo Stove and Kelly Kettle Trekker previously, and love them both. The Kelly Kettle has a bit more bulk and weight than the Solo Stove, but also boils water faster. These can take a bit to get a fire going depending on your fire starting skill, but you should be able to pack just the stove and find fuel as you need it. 4. Build a fire. We talked about fire starting methods to keep in your kit last week, and you can just light a fire and cook over it. Not the most efficient use of fuel, but if you have a fire going anyway, you might as well use it to cook your food. Choose a method that will work for you to cook the food in your emergency kit, and then practice with it! You don’t want to deal with the learning curve of cooking over a new stove during an emergency. Do you have a cooking method in your kit? I know I didn’t cover all the options here. What do you use? I have a Solo stove and alcohol burner. I use what’s called a “4th burner” pot, which looks almost like a coffee pot, but it has a bonus basket with handles inside to use for boiling eggs or cooking veggies in addition to boiling water. I can boil eggs, then pour the water for coffee or tea, or over oatmeal or a Ramen meal I have prepared myself with dehydrated veggies and better spices and chicken or beef base. It holds enough for 2 of us. I cook, even when we overnight in a hotel on our way to visit our adult children and grandchildren. When road weary, I hate having to go to a restaurant. When hurricanes threaten us, I have packs stuffed and ready, and having gone 5 days after one without power or water, I have learned a lot about prepping. I never stop doing it, and have begun to “live from” our stores by using and rotating them. My instant tortilla soup in a jar (or a vac-pack) is to die for! 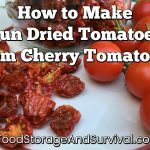 My dehydrated tomato powder is a convenience that I can’t imagine not having, and my cooked and dehydrated black beans and corn are a staple week in and week out. I have lots and lots of drinking/cooking water stored, and plan to get a new big barrel for catching rain water before hurricane season starts, to tie to a sturdy post. That’s water for flushing. Camping ware, my Food Saver, and my dehydrator will see us through bad times with a lot of comfort. My next project is to build a solar oven. Even at age 72, the fun never ends!